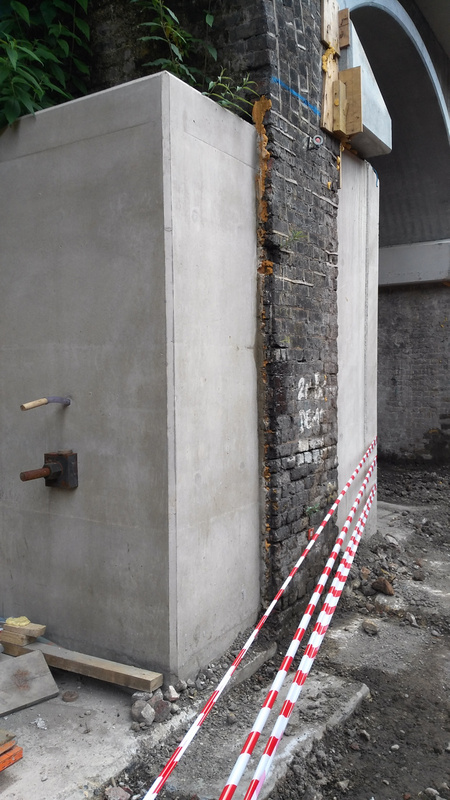 Phase 0 – May 2015 – TfL takes control of the Liverpool St (high level) to Shenfield line, a single section with no forks. 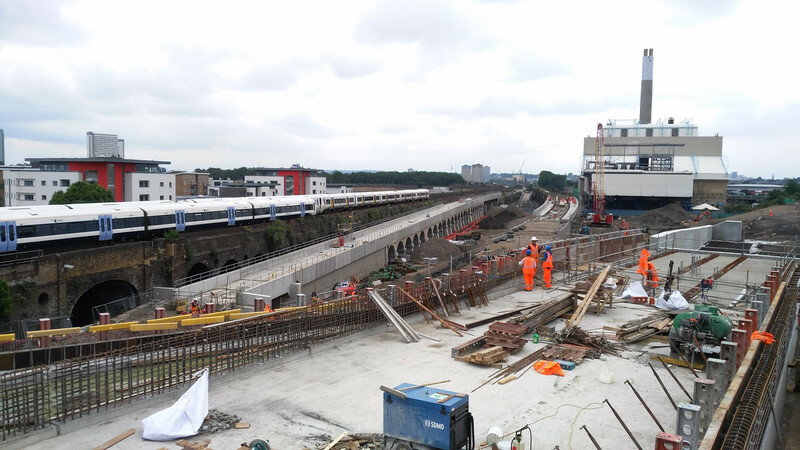 Phase 1 – May 2017 (above) – The new Crossrail trains start to appear on the Liverpool St (high level) to Shenfield line, a single section with no forks. 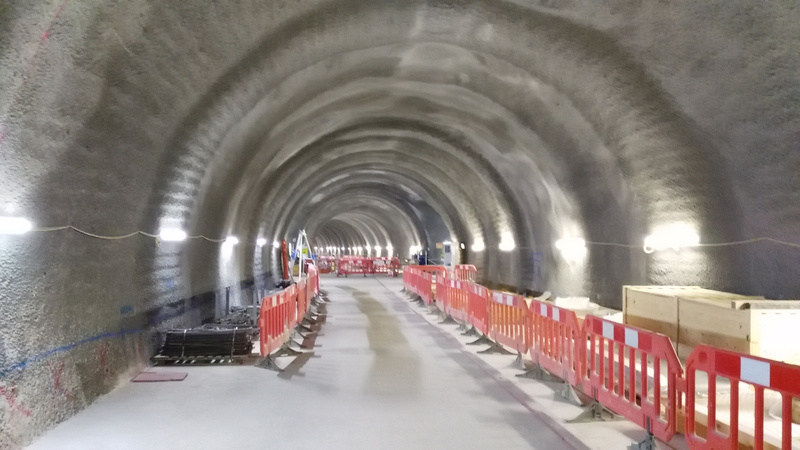 Phase 2 – May 2018 – TfL takes control of the Heathrow to Paddington (high level) line and introduces Crossrail trains to it. 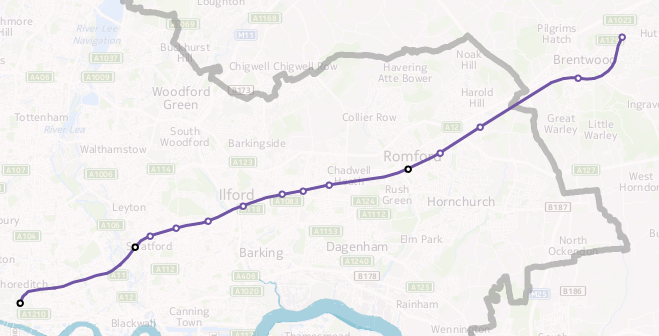 TfL Rail is now two disconnected sections with no forks. Phase 3 – December 2018 (above) – Services start running from Paddington (low level) to Abbey Wood, via Liverpool Street (low level). Services formally switch from being branded as TfL Rail to being the Elizabeth line. First trains through the centre. Crossrail has three disconnected sections, and no forks. Phase 5 – December 2019 (above) – Full services running, all via Paddington (low level) and Liverpool Street (low level), from Reading too Shenfield and from Heathrow to Abbey Wood. Crossrail is a single, connected railway, with a fork to the west and two forks to the east. [UPDATE] Following the announcement of Crossrail’s delay, it looks like Phase 3 will actually be the services running from Reading into Paddington – which will become part of TfL, in December this year. With luck, some time in early 2020, then services will start running between Paddington and Abbey Wood – a revised Phase 4. 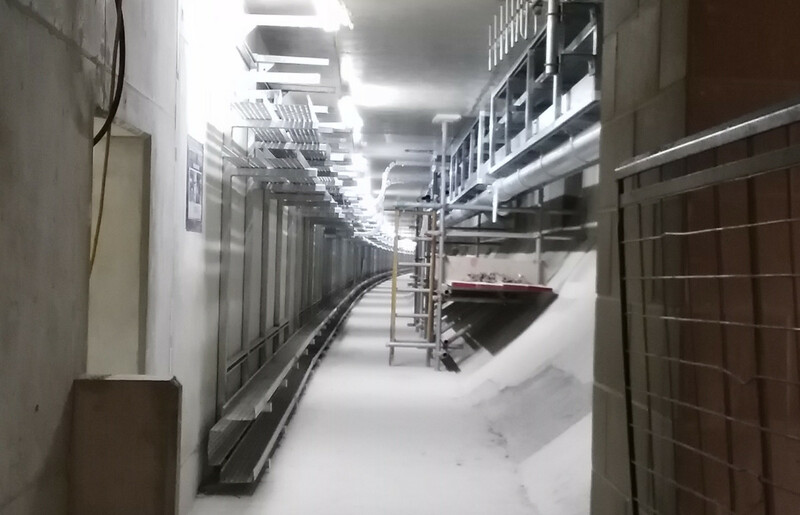 This is the separated section from existing National Rail services, so it doesn’t need to wait for the May or December timetable changes. I would imagine that the new Phase 5 – the Whitechapel link, could start in May 2020, with a new Phase 6 – services running from the west into the new tunnels, maybe in December 2020. A minor update to the GB edition of OpenOrienteeringMap – the postcode search has been fixed. Typing in a valid GB postcode should now jump to the map to the centre of that postcode. Note that postcode search for Northern Ireland is not available. Construction Open Doors 2017 is almost here – various building sites and other construction projects are opening up to the public next week. Many sites are still bookable. I’ve booked five sites to look around next week – King’s Cross Central, Waterloo International, Alexandra Palace, Battersea Power Station and Crossrail Whitechapel. I’ve visited two of these sites before so it will be interesting to see what’s changed. Look out for a writeup of each of the above in the next few weeks. 12 around Loch Monar – there are lots of Munros accessible from this remote loch, accessed from Glen Strathfarrar, best suited for a summer 3-4 day multi-day trip with wild camping. It’s been a long while since I did this. 3 more from Strathcarron – these are all easy ones, good for winter, climbable in two days. 6 around Glen Affric – Alltbeithe bothy is a long walk in but potentially a very useful base for doing these in 2-3 days. 5 around Loch Quoich – another remote loch although with a road at least. Includes the westernmost of the South Glen Shiel Ridge which is normally climbed from the other direction. Three days in the summer or four in winter. 1 near Loch Hourn – Beinn Sgritheall. 5 in The Great Wildnerness. A good, very long summer’s day. 2 on An Teallach – 1 day. The most technical ones remaining. 1 – Seana Bhraigh – very long walk in/out. 4 from Glenshee in a day including Cairnwell, the easiest one of all. 1 awkward one south from Linn of Dee. 2 very remote ones from Linn of Dee, to the south-west. 2 very remote ones from Linn of Dee, to the north. 2 more from Linn of Dee, to the north-east. 2 more from Braemar itself (head of the Linn of Dee). 1 from Corrour station – Sgor Gaibhre. Could be a good final one if the train timings work. 2 from Tyndrum – although rather awkward to get to, in one day. 4 from Loch Tulla – a long-anticipated big mountain day. That makes 28 more mountain days. I’m planning on doing all the Southern Cairngorm ones in late July/early August, to coincide with the Scottish 6 Days orienteering event which is near there. Below is a low-resolution view of the London City Race orienteering maps that have been used since the race was first held in 2008, arranged geographically to show their relative position. The maps were drawn by myself (initially) and Remo Madella (subsequently) who joined them together and assembled this image. 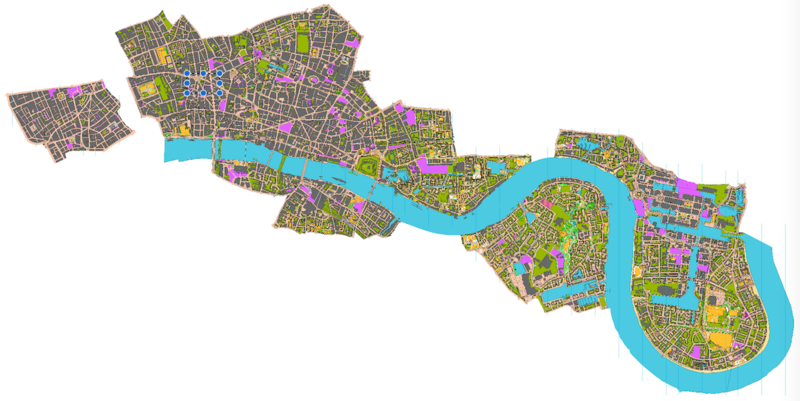 Dark grey represents buildings, with olive green for private gardens and other off-limits land, and pink showing construction sites. The map is not entirely up-to-date, as only the relevant section is updated/extended, for each race. There are only a couple of small gaps, between Covent Garden and Aldwych, and between Wapping and Limehouse. These aside, it would be possible to run on a proper urban (ISSOM) orienteering map, from Oxford Circus in the West End, right down to Island Gardens on the tip of the Isle of Dogs. Such a run would be well over 10km, and the accompanying map would be over two metres long at its 1:5000 native scale. The maps contain OS data which is Crown Copyright and database right Ordnance Survey, 2007-16, with licence # 100015287 for non-OGL content. A couple of weekends ago it was Open House London, two days where hundreds of London’s more interesting buildings open up, for free, for curious passersby (and organised pre-bookers). The capital fills up with interested parties carrying the distinctive green books. This year, on both days, we were only free from around 3pm onwards (due to a wedding and a sports race on Saturday and Sunday respectively) so had to optimise carefully with most places closing by 5pm – so we focused on the eastern part of the City of London, where there is a great density of interesting (and open) buildings. This was a pre-booked tour and involved a couple of queues and a wait before getting in. Once on the 3rd floor lobby (there are multiple levels), we looked at an impressive Lego model of the tower (also known as the Cheesegrater), before heading up in high-speed lifts to the 14th floor, where the architectural practice which designed the tower, and numerous others including the famous Lloyds of London opposite, is based. There is a striking gap (see pic above) in the interface between the lift landing area and the workspace, followed by a glass-panelled room where the practice’s servers are based – very neatly racked, as they are visible to all who enter, stored behind glass. The kitchens and meeting rooms are here. The lift landing area contains the bathrooms, where the bottom of the sinks are angled horizontal in exactly the same way that the tower is angled vertically – that is, with a 20 degree tilt. This all means that the rest of the space can be completely open – and it is, on this floor. 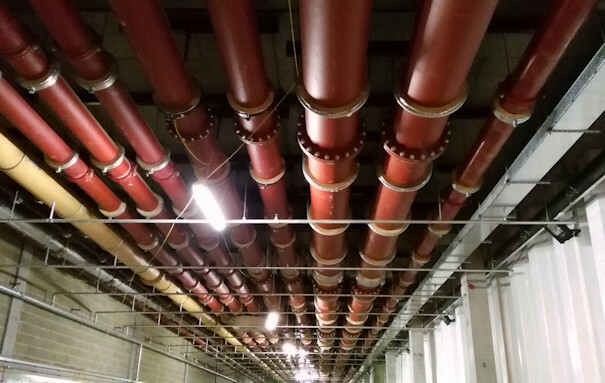 Even the ceiling panels were not installed, instead, the plant infrastructure was left. This creates a void which allows talking and other office noise to just disappear. Sir Richard Roger himself sits at the far end of one of the long desks – his desk noticeable for having no computer on it. The windows have stickers on them showing which way to look towards other buildings designed by the practice. The most iconic building of all though, perfectly lined up with the tower (and the reason why it has to tilt backwards) is St Paul’s Cathedral, out to the west. By 4pm on Open House London days, most buildings are shutting their doors or have set of their final tour. 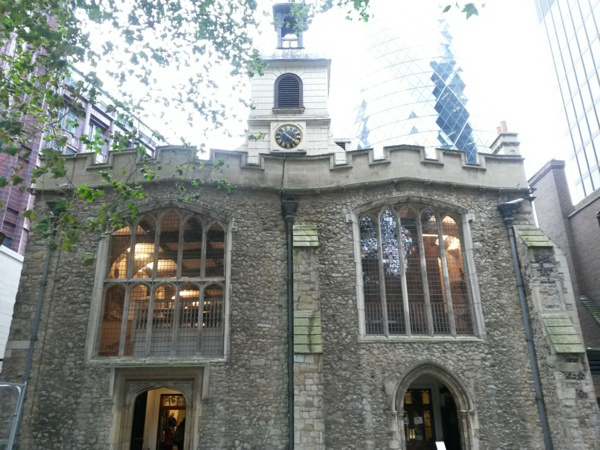 So we were lucky to stumble into St Helen’s Bishopsgate, just 100 years from the Leadenhall Tower. This ancient and curious church, formally a nunnery and parish church now joined together, was badly damaged in the 1990s IRA bombings, and has radically restored. Inside, it is very bright inside, it is largely a box shape with the platform off to one side rather than being in the middle. The floor was also raised by nearly a metre, so that some of the older stone memorials have a pronounced drop downwards from the floor edge to them. One particularly interesting and unusual feature is the walk-in baptistry. One of London’s livery halls, and recently famous for the Great British Banquet, this is an exceedingly grand and opulent set of rooms, accessed through a suprisingly small doorway and corridor. 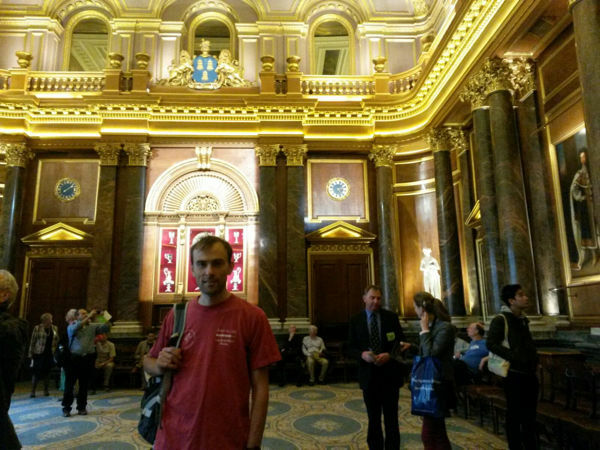 It was great to be able to just walk in, get handed a guide and wander under huge chandeliers and huge, gilded ceilings. This was another pre-booked tour, with tight (X-ray) security and a strict ban on photography. 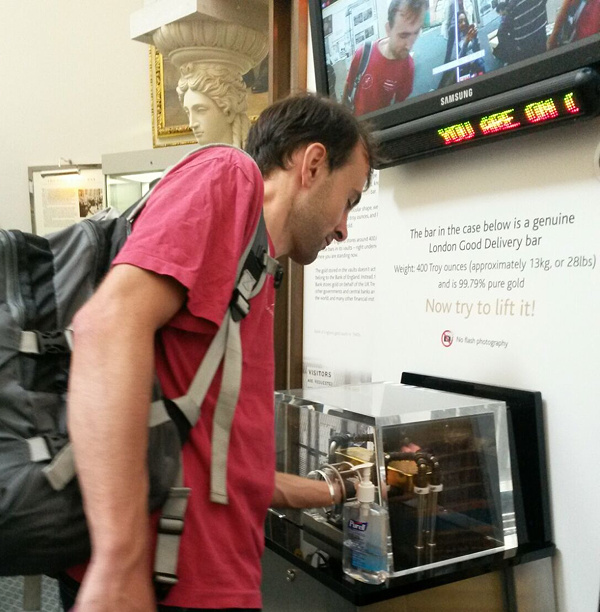 Fair enough – it is the Bank of England, and while the museum is normally open to the public (on weekdays), this was a tour inside the functioning rooms themselves. 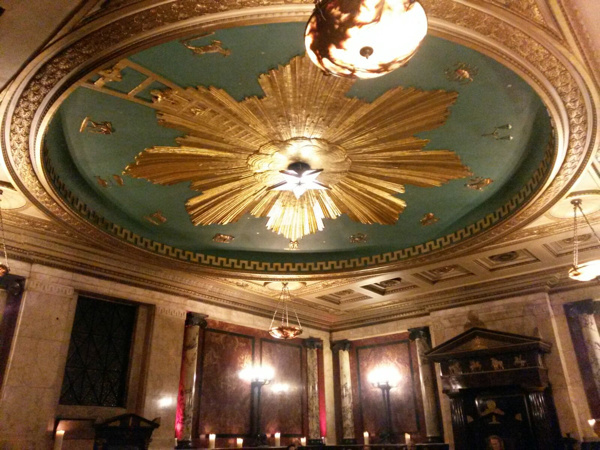 The tour included the marble floors and the parlour rooms, though not the gold vaults. The parlour rooms are very opulent and set in historic styles, even though the bank was rebuilt from the ground up in the 1930s. They include a red room which is set up like an “old boys clubroom” and is for visiting guests, a blue room which is where the Monetary Policy Committee meets to make decisions on interest rates etc, a green room which is a larger and more rarely used room for larger meetings and banquets, and finally a yellow dining room. Most of the rest of the bank is just standard office space and so we only saw a glimpse of these bits. We then exited into the museum itself, where we were able to lift a gold-bar (through a hole in a perspex box and with theatrical security – four CCTV camera screens, two members of staff flanking the box). A ticker display above showed the current value of the London Gold Standard bar I was holding – £399,000. I did manage to open another perspex box in the museum though – one operated by a rotary combination lock, the sequence of which can be revealed by answering a number of questions. It still took a good 10 minutes to perform the required number of rotations to the correct accuracy, with suitable pauses between. The token inside could then be swapped for a mini “gold bar” pin badge freebie. Quite a long queue to get in for this final building – perhaps because it was one of the few still open for access as Open House London was drawing to the close. Eventually we squeezed in, just before 5pm, into a hotel and along and up a long set of corridors and steps, until suddenly we stepped into an opulent and windowless “secret” chamber, elaborately decorated. It was bricked up for many years since the lodge was abandoned in the 1950s, only discovered a few years ago when builders knocked down a void. Now it is used for receptions and other formal events. Looking forward already to next year’s weekend, and hopefully I’ll have the full weekend to explore. I think concentrating one one small area – or alternatively focusing on one particular borough, not necessarily a central one – is a good strategy, for maximising visiting time over travelling time. Thanks to spotting a notification for a tour of several Crossrail stations as part of a get-parents-and-kids-into-construction day, I was able to visit a space deep beneath Oxford Street and Tottenham Court Road, back in July, to look around the huge Crossrail station there which is rapidly taking shape, with Crossrail (aka the Elizabeth line) due to start through the centre of London in only a couple of years. There is lots of activity on the site, as would be expected, and at times it was tricky for the tour to move around, but eventually we made it to level minus 4 – platform level, and were able to walk the length of the platforms, as well as an intermediate tunnel that runs between them, to get an appreciation of the scale of underground Crossrail stations, which are noticeable bigger than their regular tube equivalents. One real surprise for me was to see the distinct curve on the eastbound platform. It’s the only underground one in the Crossrail network, and was necessitated by the tight nature of threading the stations and tunnel tubes through the area – at one point, less than a metre from the Northern Line platforms there. 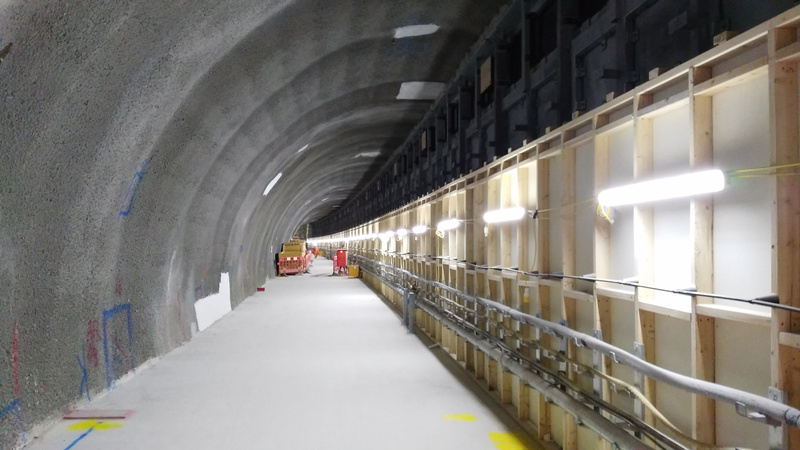 The curve will no doubt provide challenges for the station cladding, as well as the automatic platform-edge doors that will be on all the underground stations on Crossrail. We also got a glimpse of the huge bank of escalators which will take people up and down from the station level. Pouring the huge slab of concrete to set not horizontally, but at the 30 degree angle of the escalators themselves, was another considerable engineering challenge. Level -4 is not the lowest level, and we also got a quick look at Level -5, which runs underneath the platforms themselves and provides all the cabling and pipe infrastructure for the station and indeed the running lines themselves. No more cables running along the nice new tunnel tubes, or disfiguring the space age, Star Wars-like stations with their white acrylic panel sections and organic looking curves rather than corners. 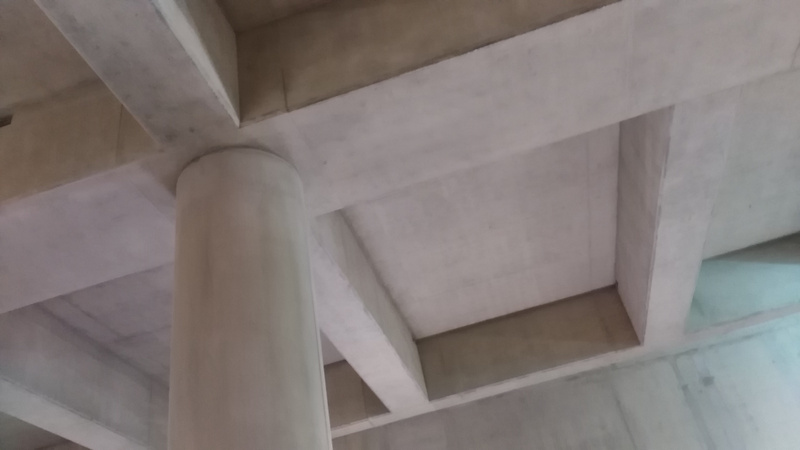 It was also nice to see a glimpse of some rather pleasing looking concrete ceilings – they reminded me of the bold Euston Station ceiling that hardly anyone spots – sadly I suspect they will not appear “raw” in the finished station, but the green and orange glows of the worklights on them looked great. All in, a great tour of one of the stations that will be a significant addition to London’s transport capability, and looking forward to seeing the finished product at the end of 2018. The third tour I managed during the Construction Open Doors week of events back in June was to the site of the Bermondsey Diveunder. After visiting the (re)beginnings of a skyscraper, and a huge building development – this was something very different – a project building downwards, reusing old Victorian arches and the space between tracks on a very busy junction near London Bridge station, to allow for a “metro” frequency service into London Bridge and up through the centre of the capital to St Pancras – the so-called Thameslink Programme. The project is building a “diveunder” – letting certain inbound services pass beneath outbound services elsewhere, so allowing a greater frequency of service. 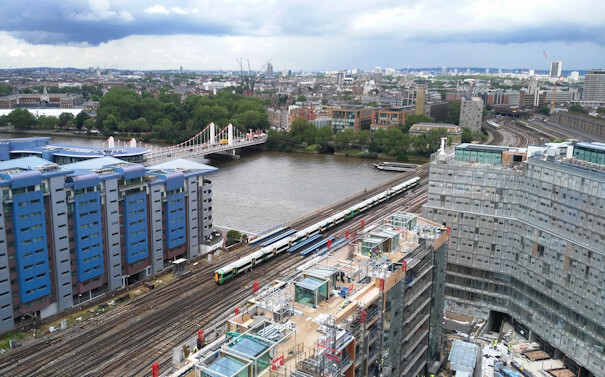 Essentially it is “grade separating” a busy junction, which happens to be part of the world’s oldest railway viaduct and once the longest viaduct of any kind, stretching over four miles from London Bridge to Greenwich. 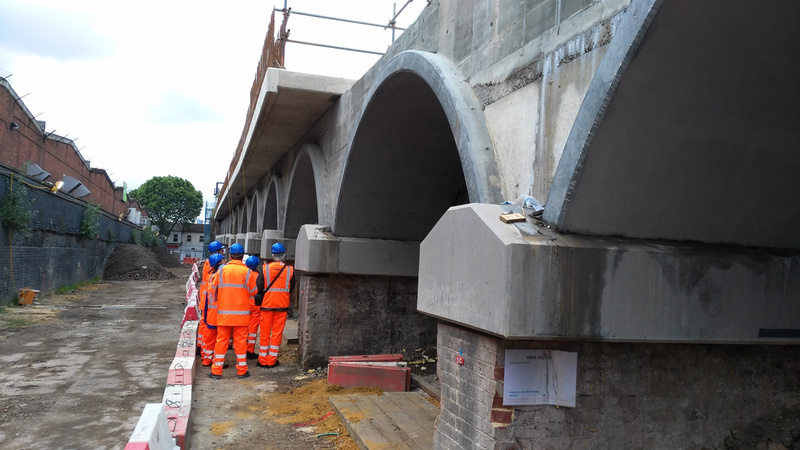 From a historical perspective, it is nice to see that as much use of the existing, historic arches as possible is being made – the main part of the diveunder itself sitting on them until it ducks too low and they are replaced with smaller, modern ones, and eventually solid concrete. With the first big part of the new London Bridge station concourse opening up this weekend, things are starting to gear up and hopefully the extra capacity created by the diveunder will, in the short term, help to repair the currently badly suffering Southern services through the area, once it is opened in just a few short months. The tour ended personally for me with a sour note – I returned back to find my bike was stolen. I’m happy to put South Bermondsey on my list of places to avoid in London in the future, except perhaps looking out of a train window at the new, sweeping lines that have been installed here. I’ve been slow to write about all my Open Doors week construction-site visits back in June, but as well as seeing a soon-to-be-skyscraper, I also made it to two other sites, the largest of which far-and-away was Battersea Power Station – more specifically, the “Phase 1” work beside it, which is the construction of two huge 20-story-high blocks that will surround the venerable power station – itself also a building site right now as part of the “Phase 2” work. The blocks were all sold off-plan long ago, and construction is taking place at a frenetic pace, as the developer aims to deliver the accommodation as soon as they can. The sheer amount of activity is breathtaking, with over 2000 workers on site. The tour included a visit to the basement infrastructure of the new blocks, as well as looking inside a couple of the flats (which include pre-fabricated bathrooms that have been just dropped in), and – the definite highlight – a journey up a hoist to the roof, from which you looked down to the roof of the old power station, or across the Thames to central London, and to the garden of the £4m+ penthouse that will be there soon. 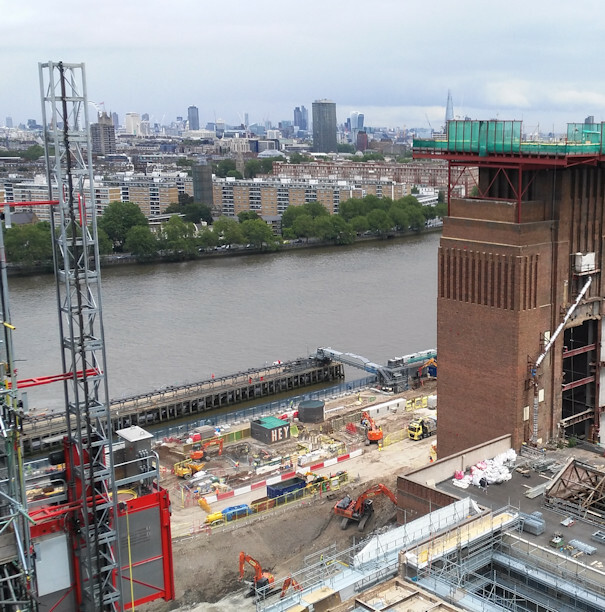 There were a few additional surprises, such as a spiral staircase being constructed, and a close-up view of the power station in transformation (the route to the Phase 1 work is along a narrow pathway between the station and the river). 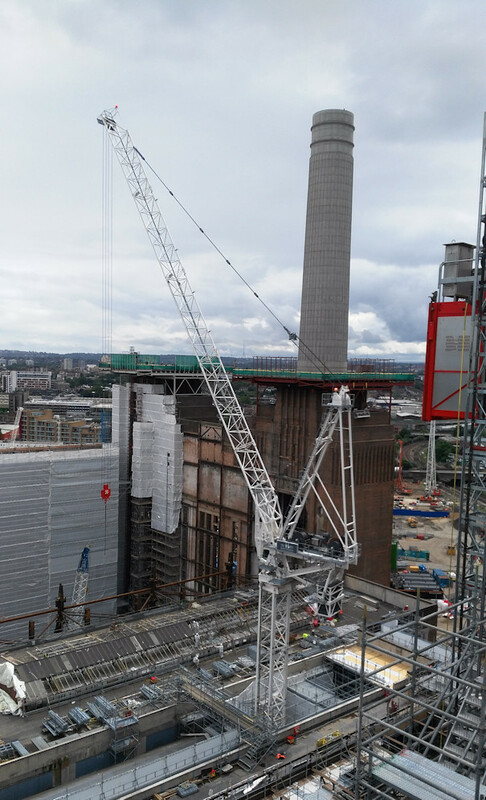 It was great to see too the chimneys of Battersea Power Station being restored – having disappeared from the skyline at the beginning of the project (sulphur damage had made them structurally unstable), the first of the four replacements, constructed with the same techniques and materials, has now reappeared. 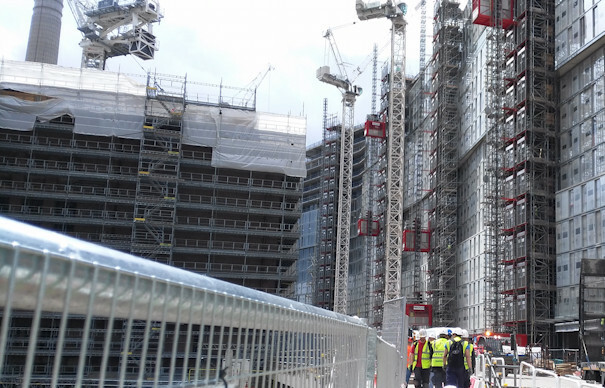 It’s Open Doors week this week, where the public get a glimpse into many construction sites, and this morning I visited the site of 22 Bishopsgate, in the City of London. The site itself has an interesting recent history – it was going to be the Pinnacle, an elaborate, spiraling skyscraper. But construction stopped as the downturn hit hard in 2011, and for the last few years, it’s been nicknamed “The Stump” – an abandoned nine-storey concrete core. 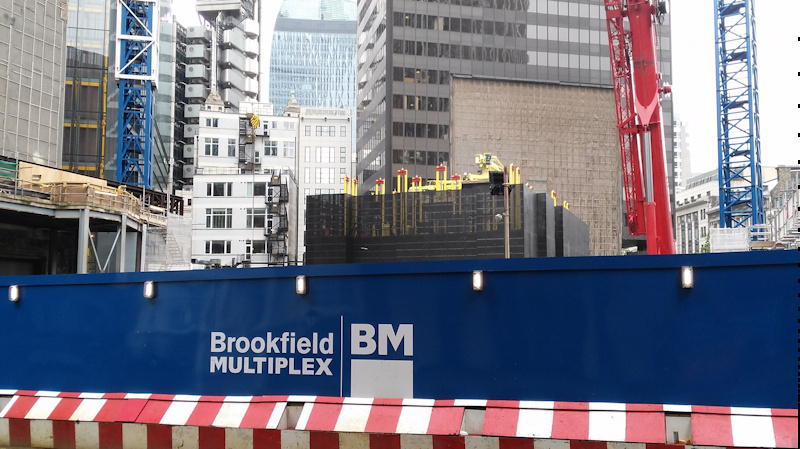 It’s taken Brookfield Multiplex, the chief contractors for the new skyscraper, around a year to dismantle the old core, by slicing up the concrete into 8-14 tonne sections, lifting them out, digging back down into and rebuilding the basement to the new design. Finally, pretty much in the last few weeks, they’ve been able to stop digging down and start building up again. The building will start to rise quite quickly in the next few weeks. The new design consists of two cores – a square-ish one, which will lead a rectangular one alongside. 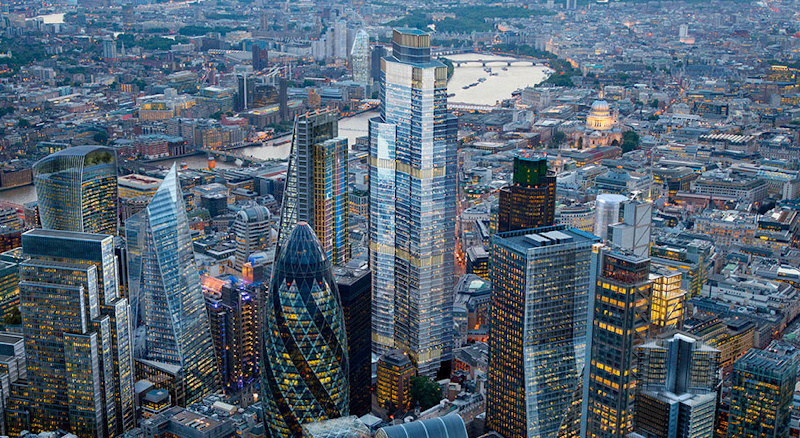 This reflects the non-square shape of the site – it being narrow to the north than to the south, and squeezed to the east by the Cheesegrater and the long-suffering Hiscox building. Both will rise by around a storey a week, with the square one leading the rectangular one by around five storeys, and the metal structure of the floors surrounding the cores another five or so storeys below. Currently, the main core is 2-3 storeys up already and is about to start its long continuous rising phase. 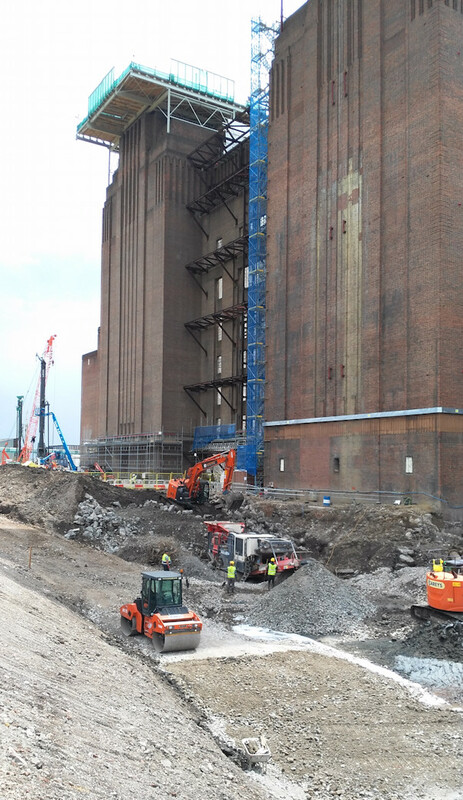 The rectangular core, which we looked down on from the elevated viewing platform, is a storey below ground level at the moment, and today is having a temporary wall added to the top of it, creating a platform and work area “raft” that will rise up with it. The square core already has its temporary wall erected, coloured black and made of perforated steel, and can be seen as the main feature in both the photos above and at the bottom, surrounding a small yellow crane and other yellow machinery that will sit on the raft. 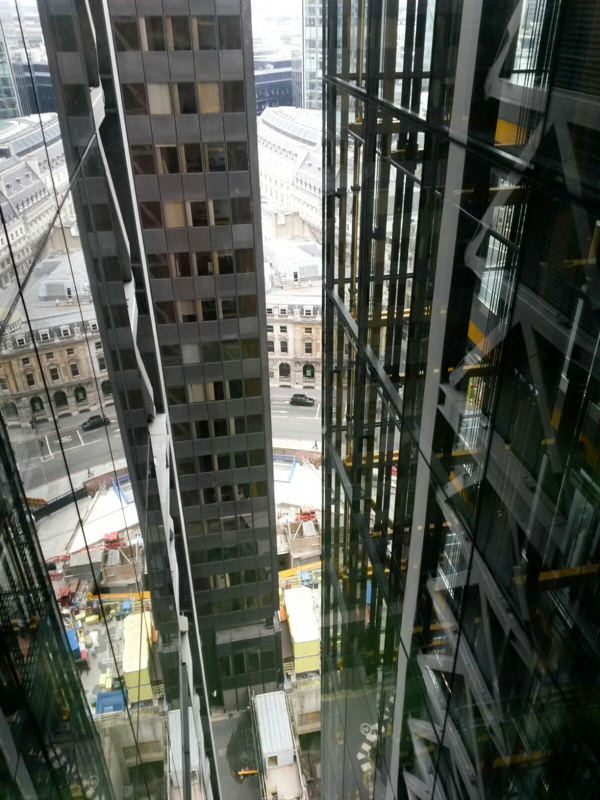 From the viewing platform, we could also see active work going on for 100 Bishopsgate, just up the road as the name suggests, as well as the recladding and height extension of One Angel Court, and finally a very small tower going up in the small space between Bishopsgate and the Natwest Tower. 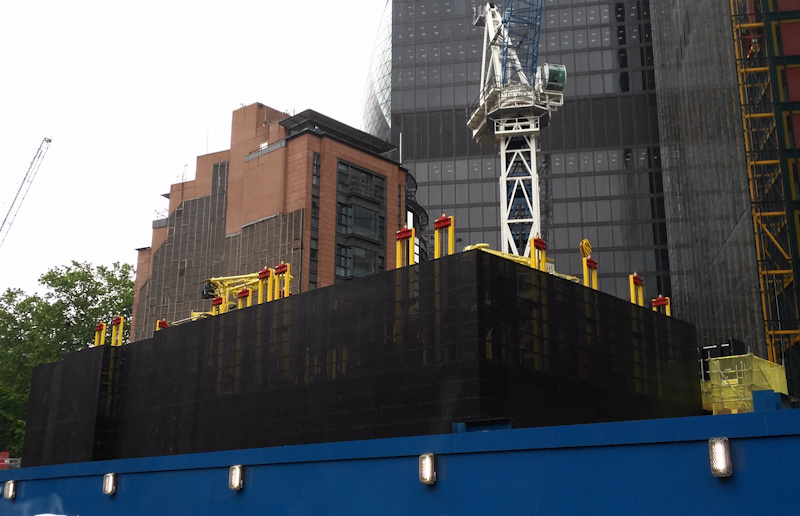 As part of this latter project and 22 Bishopsgate itself, the Highwalk around the Natwest Tower has now been completely removed. This is a shame – it was a largely unknown but nice elevated walking space. However, I understand that the Highwalk will be rebuilt once both projects are complete, so we will once again be able to walk above the roads and amongst the towers. 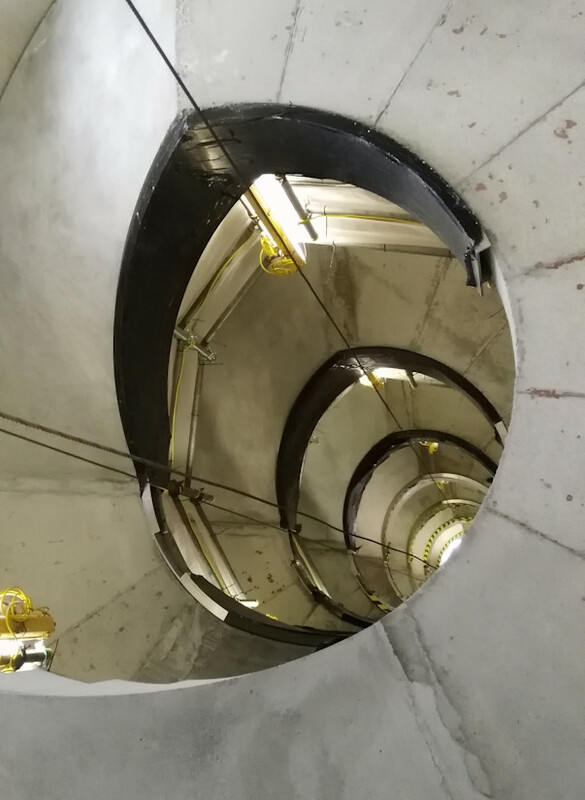 Unfortunately we weren’t allowed to take photographers on the tour, but you can see the square core clearly from Bishopsgate now – see the photos here. Our wooden-clad viewing platform can be see in the background of the first photo, on the left. Middle image is an artists impression of the completed cluster, from Lipton Rogers.